Oldman saltbush is different: it is a plant unlike others that the majority of Australian landowners have dealt with for grazing. It requires an informed degree of grazing management to get the best from it, as does most deep rooted perennial plants. Thus, training and education in management aspects is far more critical than with say Lucerne or set stocking. Grazing Management Systems recognized this fact early and has consequently developed a training program, in conjunction with Holistic Management educators, that will ensure that all our knowledge and experience can be transferred to you. We can arrange management field days & training programmes at our premises at Narromine or we can offer training at your property. Whatever option, we will make sure that you gain a proper understanding of what is needed for optimum management. Naturally, you will gain all ongoing benefits from our research efforts. 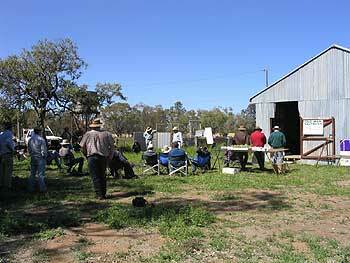 As soon as we have confirmed a new and better way of managing and working with Oldman saltbush, we will advise you. Oldman saltbush demands much in terms of knowledge and application: Grazing Management Systems Pty Ltd. is able to provide you with the management tools you need to realise its true potential.